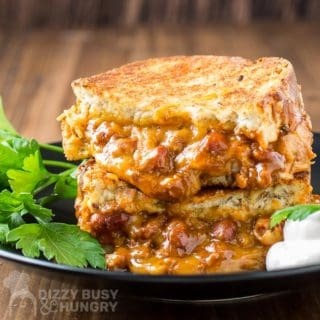 Chili Cheese Grilled Sandwich | Dizzy Busy and Hungry! 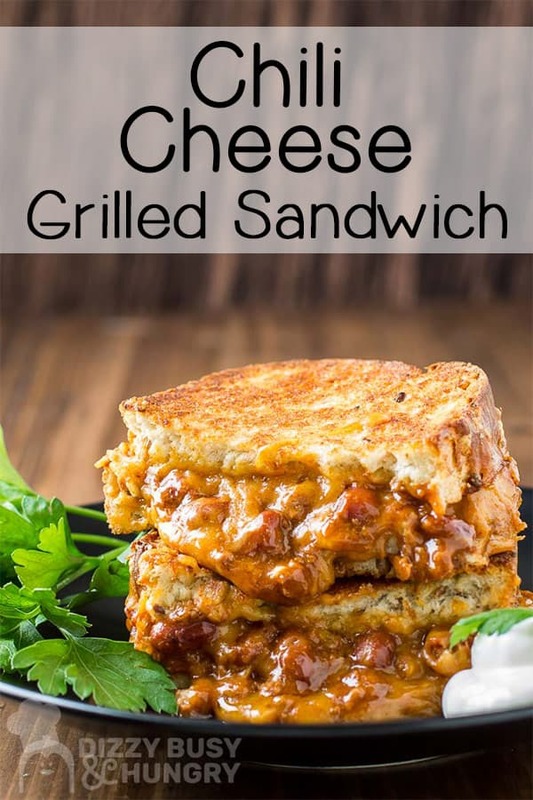 This Chili Cheese Grilled Sandwich is a great way to use up leftover chili. 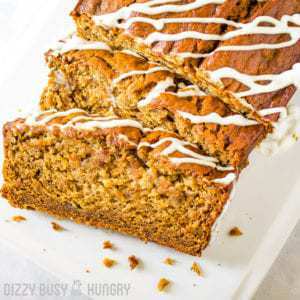 Sure, it’s a little messy, but your family will love it so much no one will mind. The crispy, buttery, grilled bread combined with the melty, gooey, cheesy filling results in the ultimate grilled cheese sandwich! Use your favorite homemade chili recipe or even use store-bought chili for a quick and easy but hearty weeknight dinner your family will request again and again. 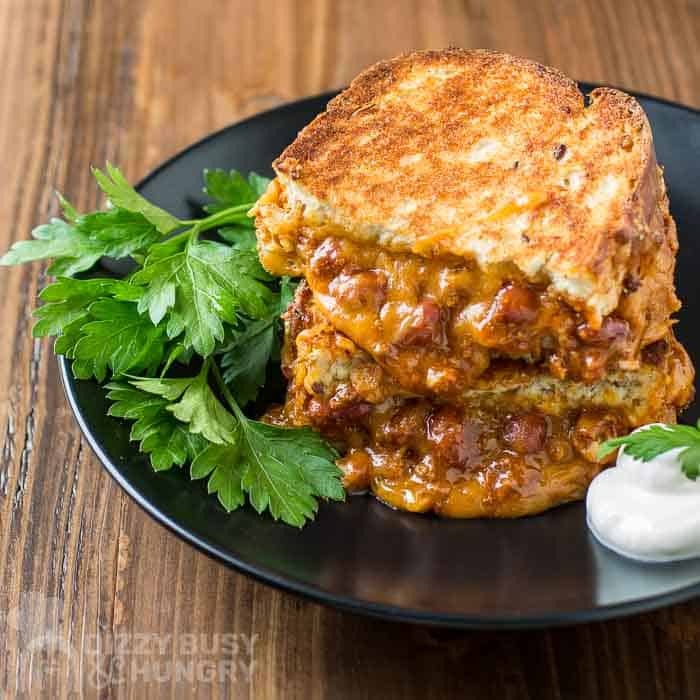 Chili Cheese Grilled Sandwiches may be a little messy, but they are worth it! 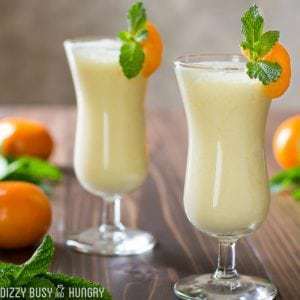 Busy weeknight? No time to cook? Try grilled sandwiches instead of resorting to fast food or take out! Grilled cheese is one of my go-to dinners during the week. 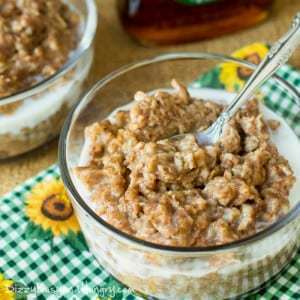 Everyone loves it, and it is quick and easy, and doesn’t require a lot of brain power. The ingredient list is short, and generally involves items I already have in the house. But, it is so simple that it can get a little old after a while. Luckily, grilled sandwiches are so versatile, there are probably hundreds of varieties you can think up! The chili cheese filling is a little messy, but it’s so delicious, no one will mind! 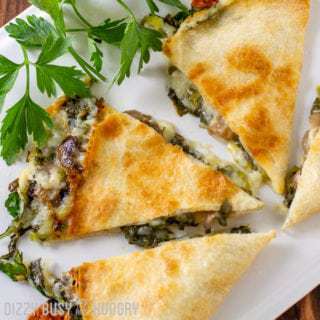 But, I have to admit, even though the whole family like those Grilled Sauerkraut Avocado Sandwiches, given the choice they will go for something that does have cheese. Which is understandable! Cheese just gets so yummy and melty on grilled sandwiches. 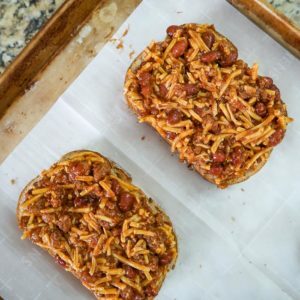 I was inspired to make this Chili Cheese Grilled Sandwich recipe when I had a bunch of leftover Crockpot Cheater Chili (I had made a double batch to feed a crowd, but several people were not able to come at the last minute), and I was looking for a way to use the leftover chili by changing it up a little. So I thought, why not make it into something like a cross between a grilled cheese sandwich and a sloppy Joe. And voila, this grilled sandwich with a chili cheese filling came to be, and the family raved over them! In a medium bowl, combine the chili and shredded cheddar cheese. Set aside. 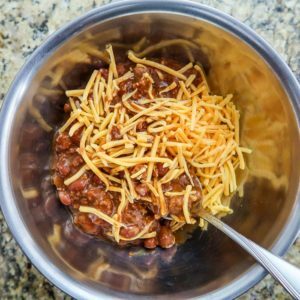 Combine the chili and shredded cheese in a bowl. Butter one side of the bread, and place the slices face down on a baking sheet. The first layer – buttered bread placed buttered side down on a baking sheet. Distribute the chili and cheese mixture over the slices on the baking sheet. Distribute the chili and cheese mixture over the four pieces of bread. Place the remaining slices of bread on top of the chili and cheese mixture. You can use leftover chili, or make your own, or even use store-bought chili. This works with all different varieties of chili! 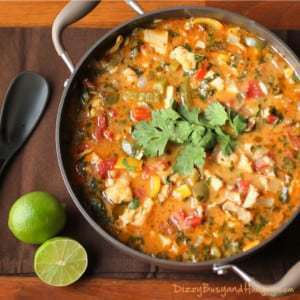 Meatless, chicken chili, etc. 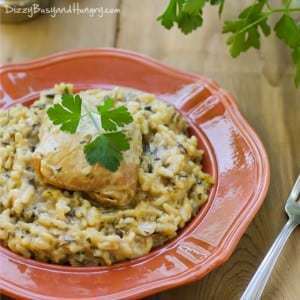 Different varieties give this dish a different spin, but they are all delicious! 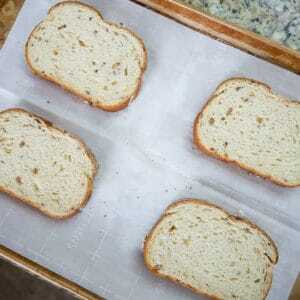 Use parchment paper on the baking sheet for easy cleanup. The filling does tend to ooze out while baking. Ovens can be fairly different, so be sure to check often the first time you make this so you don’t accidentally burn your sandwiches! 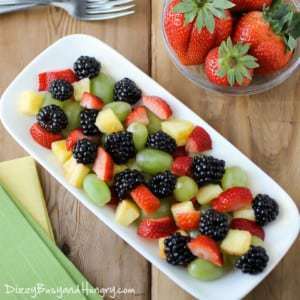 You can also grill your sandwich on a griddle, or saute pan, or stovetop grill pan. Wherever you would normally make grilled cheese sandwiches will be fine. Just remember that the filling may get a little messy! The crispy crunchy grilled bread and gooey chili cheese filling make this sandwich irresistible. 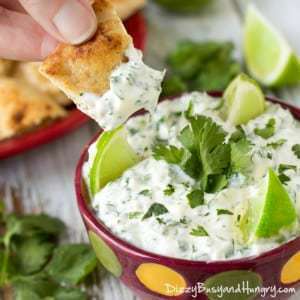 Serve hot off the grill with sour cream and parsley for garnish. Or dig in without any of that! It will be delicious either way. 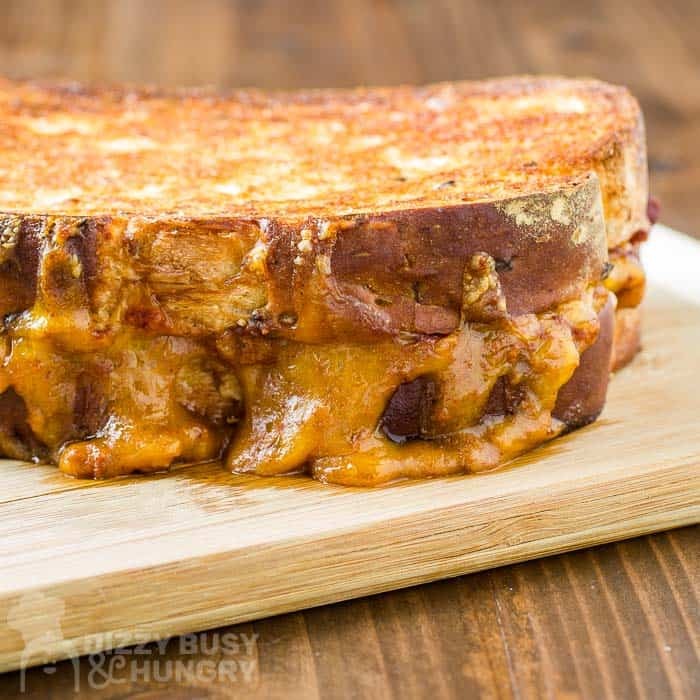 This Chili Cheese Grilled Sandwich is a great way to use leftover chili. The crispy bread and cheesy, melty filling results in the ultimate grilled cheese experience! In a medium bowl, combine the chili and shredded cheddar. Set aside. Butter one side of each of the 8 slices of bread. Place 4 of the slices buttered side down on baking sheet. Distribute the chili and cheese mixture over the 4 slices of bread. Place the remaining 4 slices of bread on top of the chili and cheese mixture, buttered side up. 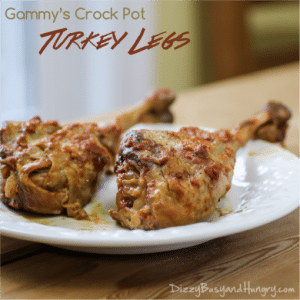 I love to use this recipe with leftover homemade chili, but you can also use store bought. Any kind of chili will work, even meatless or chicken chili. 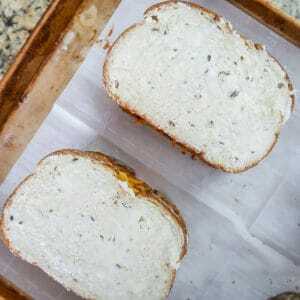 The chili cheese filling tends to get melty and ooze out of the sandwich during baking, so you may want to line the baking sheet with parchment paper for easy cleanup. You can use a skillet or griddle to grill your sandwiches if you prefer. This Turkey and Brie Grilled Cheese features creamy brie, roasted turkey breast, and a cranberry spread stuffed between two pieces of sourdough bread and grilled until crispy. So delicious! And this Parmesan Crusted Grilled Chicken and Cheese is another upscaled grilled cheese sandwich with Parmesan crusted bread stuffed with chicken, cheese, and green olives! Looking for some additional grilled sandwich recipes? Check out this resource for 18 Insanely Good Grilled Cheese Recipes. 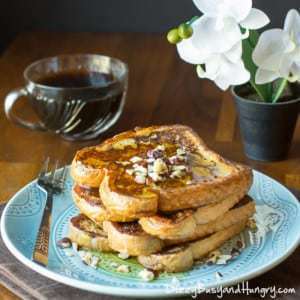 Or this article that list the Top 10 Grilled Sandwich Recipes. They look amazing! What is the most creative grilled sandwich you have tasted? Leave a comment and let me know what you think! whoa this looks messy and delicious! 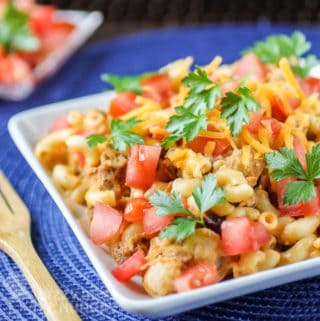 What a great way to use up leftover chili! My family would love this! Thank you for sharing at Fiesta Friday! 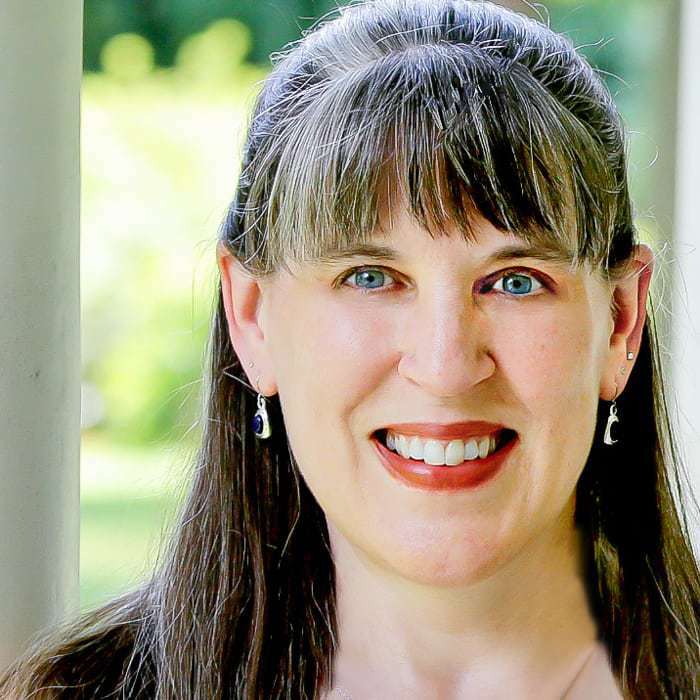 Thanks, Antonia! I appreciate you stopping by! 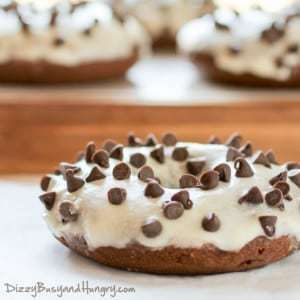 This is such a delicious twist on a classic! 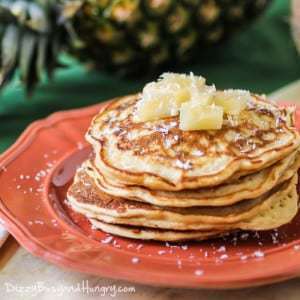 I’ll be making this recipe over and over again! Even better than a regular grilled cheese! I know my teen son would love this. My teen guys are huge fans. They would eat this every night if I would let them, haha! 🙂 Thanks for stopping by!